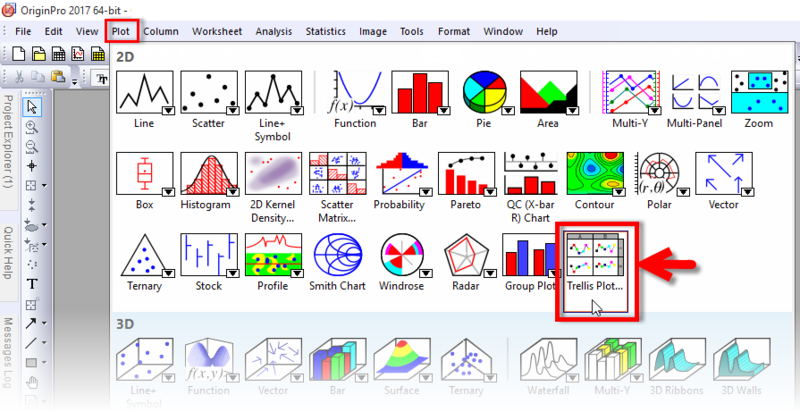 Trellis Plots (Trellis Charts) are an important new feature in Origin 2017 as they have become a popular method to present data in a grouped manner. 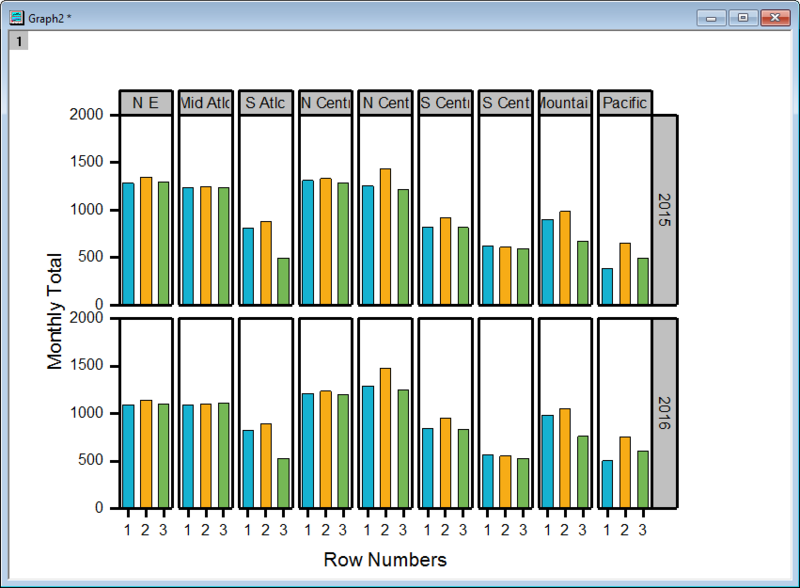 In this blog post, we will learn how to create a basic Trellis Plot with the goal of better understanding the process when using Origin. We will be using two years of regional Heating Degree Day data compiled from original data provided by the National Weather Service Climate Prediction Center. 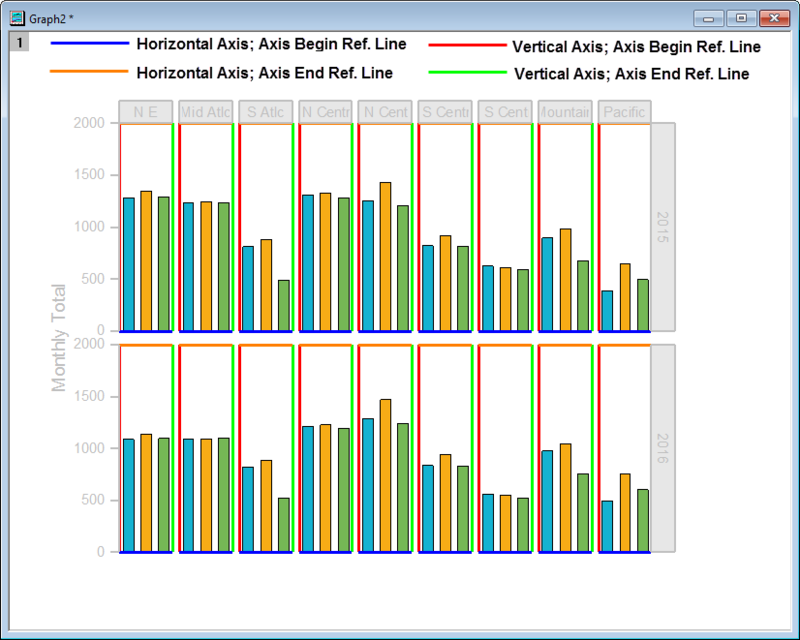 Updates: We implemented Trellis with Double Y Axis in Origin 2019. Please read this blog for details. For the first step after compiling the original data, we set Region column as Categorical and specify custom sorting for graphing. Next, we add a new column entitled Normal. To this column, we add an F(x)= formula: D-E (which is the new Spreadsheet Cell Notation in Origin 2017; this formula simply subtracts column E from column D). Follow the numbered steps in the picture below to create Trellis Plot. 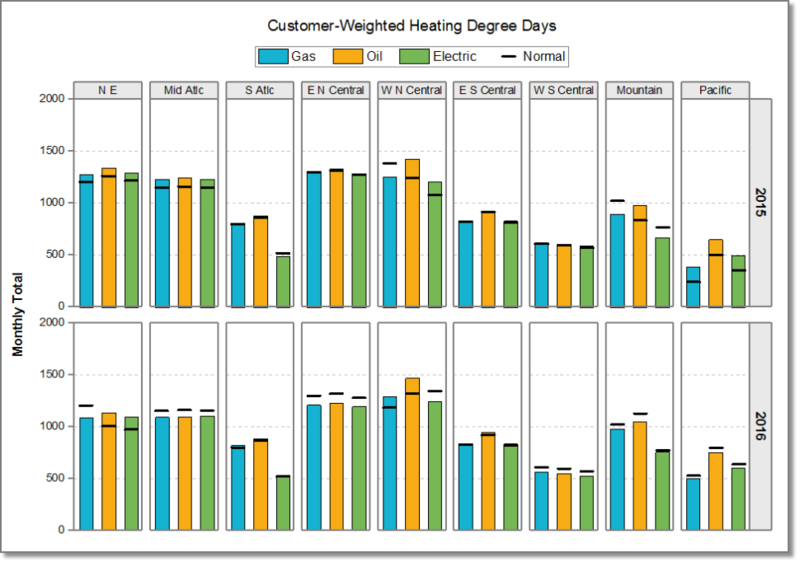 We’ve plotted the Monthly Total (heating degree days) for three fuels grouped by Region and Year. Add, delete or modify horizontal or vertical panels. On the Color List tab, check Use custom increment list and customize the color list that appears being concerned with the first three colors. Next, navigate to the Spacing tab and set the Gap Between Bars: 40%. Also select “Graph1” node on left panel to set the graph page size: set the Width: 10 inches and Height: 7 inches. First, double-click on the X-axis to open the Axis Dialog. Hide the bottom Lines and Ticks, but set the Top Lines and Ticks Thickness to 1.5 and Color to Gray. Set the Left and right Lines and Ticks to both be 1.5 Thickness and Gray Color. To format the borders around each panel, navigate to the Reference Lines tab in the Axis Dialog. For the Vertical axis, click on the Details… button and in the Reference Lines dialog that pops up. Change the Color to Gray and the Thickness to 1.5 for both the “Axis Begin” and “Axis End” reference lines (see below) and click OK. Repeat this for the Horizontal Axis. 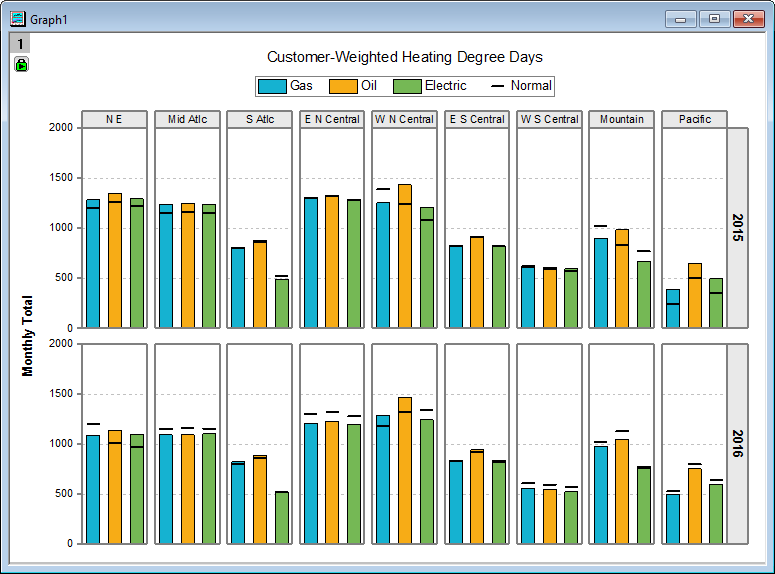 Finally we’re done and can close the Axis Dialog by clicking OK.
Now we add another plot to the Trellis plot as scatter plot to display the “Normal” heating degree day values. 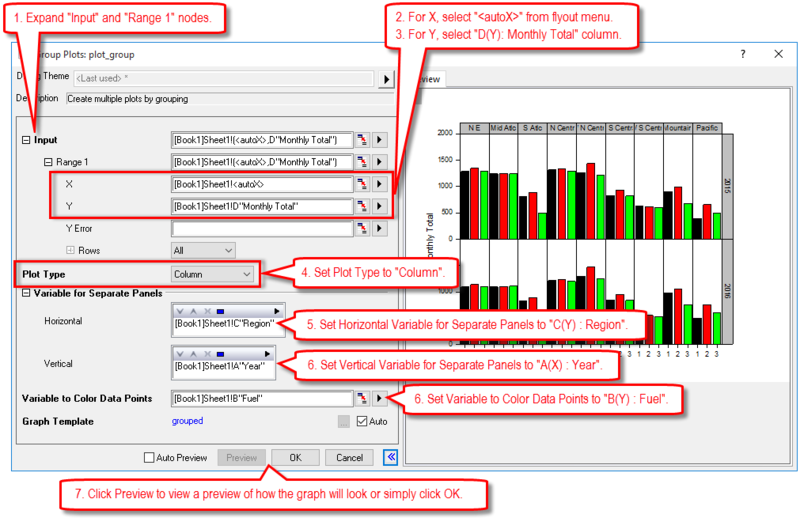 With the graph active, right click Layer 1 icon and choose Plot Setup… context menu to open the dialog. Choose Plot Type: Scatter. Check <autoX> as X to use row number as X values. Check “Normal” column as Y. Click Add button to add it into the graph. Click OK to close the Plot Setup dialog. Though it is not obvious, there is a new plot on the graph. Open the Plot Details dialog, and select the node for the second plot. 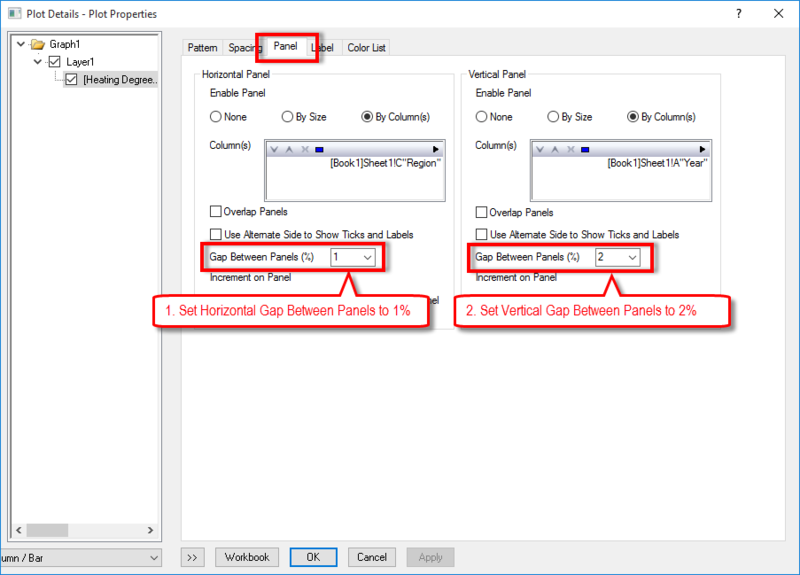 Set the Symbol Shape to the horizontal bar and set the Size to 11 and the Edge Thickness to 40. Click OK to close the Plot Details dialog. Now to modify tick labels and fill colors. Reopen the Axis Dialog. Set the Left Label Font Size to 10 and the Color to Black. Set the Right Label Font Size to 12, the Color to Black and make it bold. 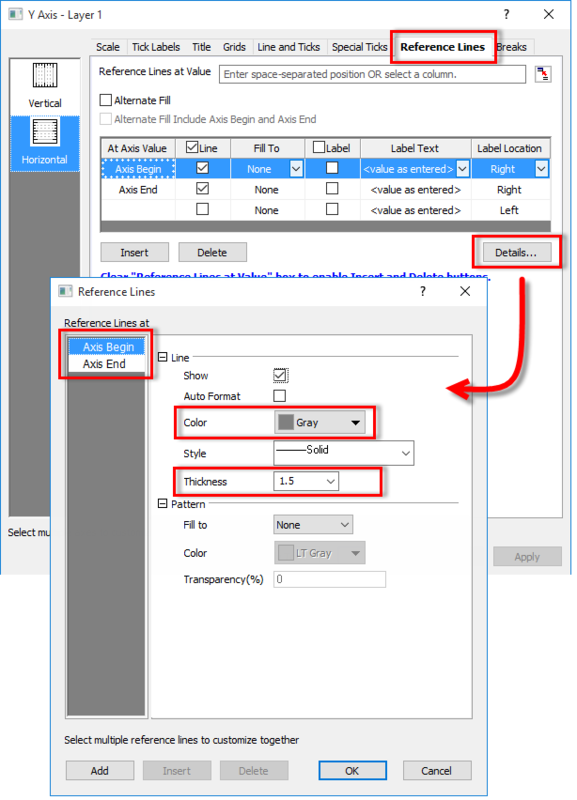 For the Right axis, navigate to the Table sub-tab and set the Fill Color to a very light shade of gray (a custom color). For the Bottom axis, hide the Tick Labels and Title. For the Top axis, set the Left Label Font Size to 10 and the Color to Black. Also for the Top axis, navigate to the Table sub-tab and set the Fill Color to the same shade of gray. Finally, set the Left Title to be Bold and Size 12. To see more trellis plot examples, please check out all the trellis plot examples in Help: Origin Central menu of Origin 2017. Can I make trellis plots with a primary and a secondary Y-axes? 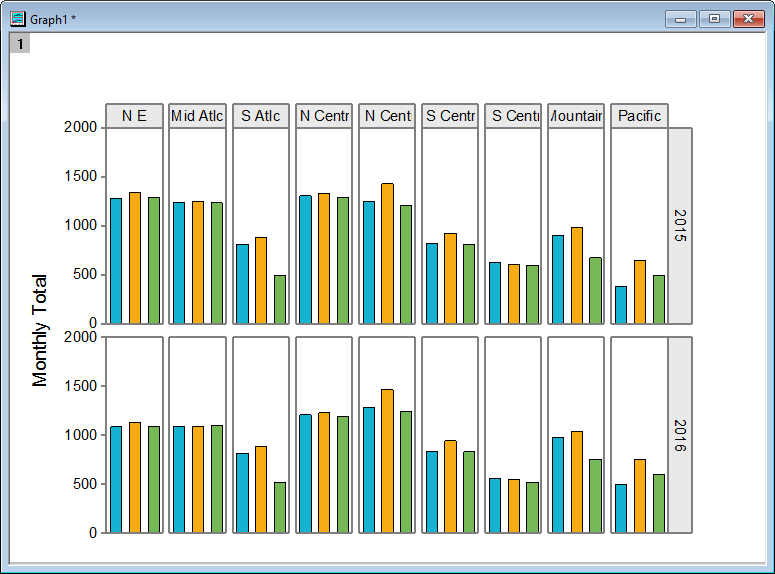 If you have two dataset with same grouping information columns, you can plot each trellis plot first. 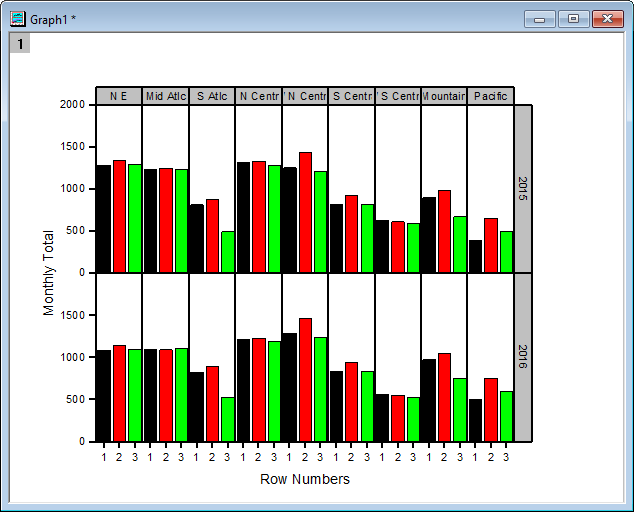 Then use Merge Graphs to merge them into a 1×1 panel so they overlap on each other but with different Y axis ranges. Then you can move one Y tick label to the right. Also move the table-like tick label to the further right. If it doesn’t work well, feel free to email tech@originlab.com with your data so that we can take a further look. We are actually going to add double-Y trellis plot support in the upcoming Origin 2019.